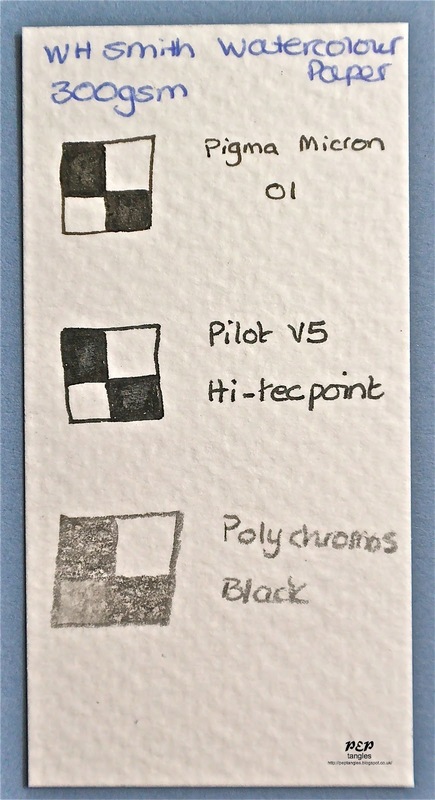 Since some of my assumptions about cardstock in relation to the Sakura Pigma Micron pen were proved wrong by the testing in my previous posting I decided that it would be worth applying the same test to the 3 different watercolour papers that I have. 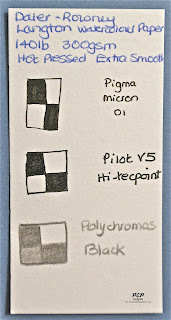 It was whilst doing these swatches that I noticed how scratchy the Pilot pen is when compared to the Pigma Micron. At first I thought it was only my imagination but when I sat down & tested the two pens again on various pieces of cardstock I became even more aware of it. The Pilot's tip has a dragging scratchy feel whereas the Pigma Micron is beautifully smooth with almost a gliding sensation in use - the difference between opening a door which hasn't been oiled as opposed to one which has. My resistance to using watercolour paper when tangling is that it seems impossible to find one that is sufficiently smooth plus white (as opposed to cream which does not contrast as well as white with the black pen) at a reasonable price. I tend not to use this watercolour paper when I'm watercolouring with inks - stamping & using a damp brush to drag the colour out - as the ink colours seem to lose their vibrancy. 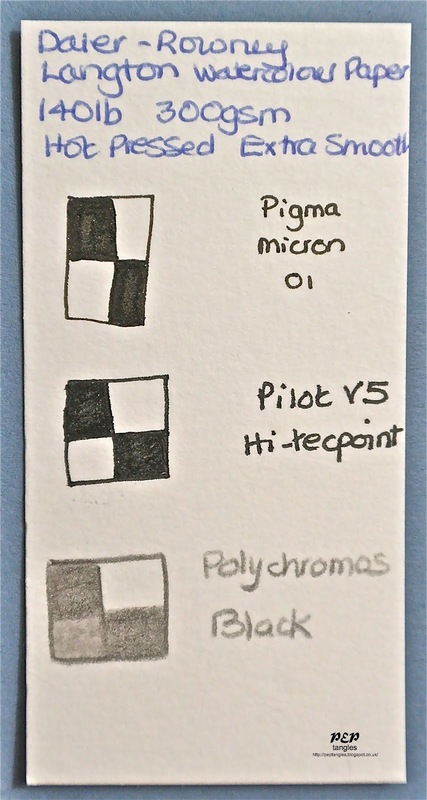 I believe this bleaching effect has something to do with the amount/type of size used during watercolour paper manufacture & therefore varies with type & brand. The Pigma Micron pen is an absolute joy to use on this giving beautiful coverage when filling in solid areas. The Polychromos pencil also blended magnificently with the tortillon. If it were not for the creamy colour, I would rate this above the W H Smith 220gsm White Card that came out best in my previous testing. 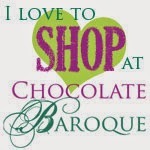 It is also more costly & far more difficult to obtain than the W H Smith card. The 190gsm weight of this paper makes it ideal for using when an image is to be cut out as well as watercoloured. It is therefore the one that I use most frequently, especially as it is extremely economical in price. 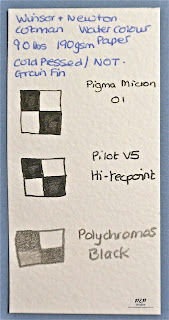 When it came to the Pigma Micron pen the coverage when filling in a solid area was very good - not as good as the Langton - but perfectly good enough. 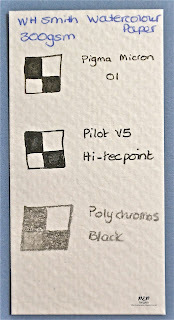 The Polychromos pencil also blended smoothly but again the Langton gave the superior result. The colour is creamy so once more I would prefer to use the W H Smith 220gsm White Card for tangling, especially as the latter is so economical. This was my first encounter with watercolour paper, before I knew very much about how differently various paper surfaces respond to inks & pens etc... I tend to use it only for making colour charts of media which require the application of water for use. 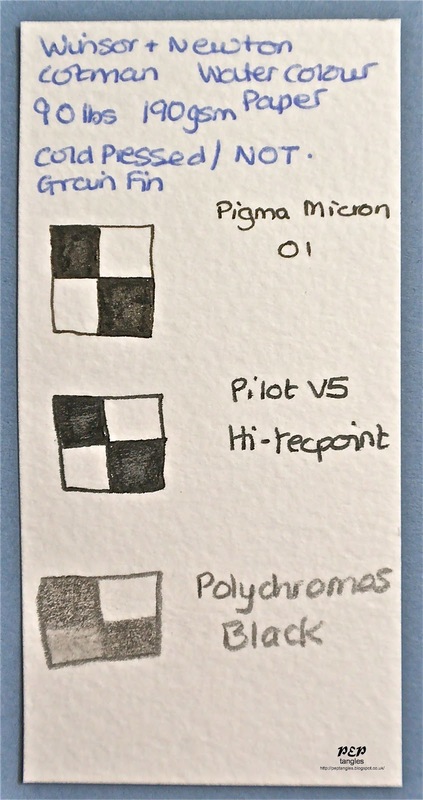 This gave very good coverage when filling in a solid area with the Pigma Micron pen but only allowed very patchy blending of the Polychromos pencil. The colour is predictably creamy but I would not use this for tangling anyway. I shall use up my supply for making colour charts but doubt that I will buy any more of it. The W H Smith 220gsm White Card remains my favourite for tangling, especially if I am going to layer it onto another piece of cardstock. If I want more weight to my project without another layer I would use the Langton - the price differential will probably become immaterial when more than one layer is brought into the equation & I may find that in time I shall prefer the subtler contrast against the black provided by the creamy colour. Great to see this done in your usual thorough style Paula. I find these posts of yours so interesting to read, they are a real treasure. I have some quite expensive Hot pressed watercolour paper as a leftover from my Art club days, I love it and use it for special DT projects. I will try it out in comparison to my Daler Rowney Hot Pressed to see how they compare. I have Faber Castell Pitt Artist pens which are pleasant to use in various thicknesses, and will use those in my comparison as well. I'll let you know how it goes. It's interesting that you prefer the WH Smith card in preference to the Hot Pressed, as it looks as though the serious CZT folks use something that resembles Hot pressed paper. I haven't tried various surfaces yet, so can't comment on my preference. I agree that the Sakura pens are great to work with, they just do exactly what you need, don't they? Thanks for these further test results which are so helpful. I visited WHS today and got hold of a pack of their card. I must say I'd not noticed any marked difference between the Sakura Pigma pen and the Pilot one but then my Sakura one is quite old and has had lots of use one way and another (I'm amazed at how long it is lasting actually) whereas the Pilot is brand new. I have always loved my Sakura Pigma pens and was glad to hear you do too! Thank you for sharing all your testing results! Such valuable and time-saving information! interesting review :). i typically use watercolor paper in the moleskine books and a micron 01. then i throw a bunch of color on it :).